The Swedish CV90 Combat Vehicle aka Combat Vehicle 90 aka Stridsfordon 90, has to be one of the most commercial success’s in AFV history of the 1990’s. Its history stemmed back to 1985 when HB Utveckling, a small holding company of the successful Swedish Bofors Defence and Hägglunds and Soner (now part of BAE Systems Land Systems) were awarded with a contract from the Swedish Defence Material Administration for 5 prototypes of the CV90 for the Swedish Army. Prior to this, a future thinking contract had been awarded, a two man turret mounting a 40mm main gun had been funded. In 1986 a further contract had been placed for 4 turrets, 3 with 40mm main guns and 1 with a 25mm main gun. One of these turrets and prototypes was selected and ordered as a production vehicle, as in 1991 the Swedish Army placed their first order. The hull, which is manufactured by Hägglunds, is sent to Bofors who manufacture the turret with their 40mm main gun and integrate the turret with the hull. First production vehicles were delivered in 1993 as the Combat Vehicle 90 to the Swedish Army. CV9040 is in service with the Swedish Army. It carries an eight men section and is designed to defeat other armoured vehicles and ground troops. It is fitted with a Bofors 40 mm cannon. The CV9040 is primarily deployed with the Main Battle Tank in the Swedish Mechanised Brigades. The CV9040C has a stabilised turret and additional protection, including mine protection, for use by Swedish troops on international operations. CV9030 was originally developed to meet the requirements of the Norwegian army. The chassis has advanced suspension to improve ride comfort and mobility and to facilitate unsurpassed stabilisation of the Bushmaster II cannon in the 30 mm two-man turret. It also carries an add-on armour kit. The CV9030 MkII is development of the well proven CV9030 to meet the Swiss and Finnish armies’ requirements. It is equipped with the digitised Vehicle Information System (VIS) and also a fully stabilised 30/40 mm Bushmaster II/Mk44 cannon. The CV9030 COM is a command and control vehicle based on CV9030 MkII, with four workstations in the rear troop compartment. CV90120 Tank has been developed to meet international demand for a lighter main battle tank. It has similar firepower to current main battle tanks and is both cost-effective and gives superior tactical and strategic mobility. The CV90120 Tank fulfils these requirements and additionally provides outstanding survivability through an integrated modular Defensive Aid Suite (DAS) for today’s fragmented and multispectral battlefield. 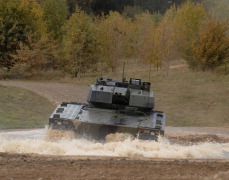 CV90120 Tank fires all standard NATO 120mm smooth bore ammunition and is equipped with state of the art technology, including an information technology network (VIS), improving operational capability. The modular Defensive Aid Suite (DAS), including Laser, Radar and Missile Approach warners, is installed. Survivability is enhanced through the Multi-Spectral Aerosol (MSA), active countermeasure system and the top-attack radar, identifying smart indirect munitions. 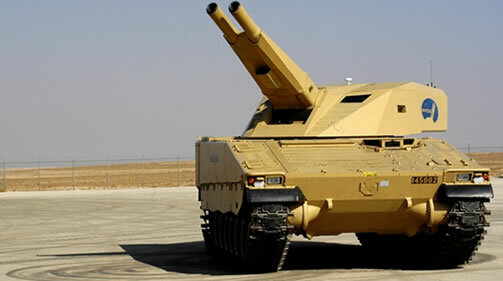 AMOS (Advanced MOrtar System) is a state of the art, cost-effective mortar system, providing high firepower under full protection, AMOS is a twin-barrel 120 mm smooth-bore mortar turret system. AMOS has been jointly developed by Hägglunds,Sweden, and Patria Weapon Systems, Finland. AMOS is designed to meet indirect firepower requirements at battalion level. AMOS can be mounted on various light armoured vehicle platforms and combat boats. AMOS has significant direct fire capability. The Forward Observer Vehicle is the mechanised units resource for controlling fire support from artillery and mortars. The vehicle carries an automatic system for calculation and transfer of target co-ordinates, including sight with a TI and laser range finder. The system is based on an inertial navigation system and provides target coordinates in seconds, thus reducing the important reaction time for indirect fire support. The Anti-Aircraft Vehicle version is fitted with a specially adapted sensor set and fire control software air defence at battalion level. CV9040 AAV is primarily assigned for combating helicopters and close air support aircraft and it is well-suited for engaging other types of aerial and ground targets. The Forward Command Vehicle is configured for the requirements of brigade and battalion combat control. It carries a crew of three and has six additional workstations in the rear troop compartment. It provides an armoured combat C3 vehicle designed to accommodate a wide selection of communication and command equipments. The Armoured Recovery Vehicle is specially adapted to fulfil all requirements of recovery and to support field maintenance operations. It is equipped with a dozer blade and a crane. It also has two separate winches and is capable of applying a t2-tonne line pull in any direction. The driver sits left of the engine in the front of the hull, with the commander and gunner in the two man turret in the middle of the turret. The rear compartment is where the 8 infantry sit facing each other. They exit the vehicle through a door in the rear of the vehicle and also have access to roof hatches. The basic vehicle is rated against 14.5mm rounds. The vehicle can be fitted with module armour. Modular armour can accommodate various ceramics, composite or passive armour, such as the world famous, shape charged defeating MEXAS. The internals of the vehicle is fitted with an NBC system and a bank 4 smoke grenade launchers is mounted either side of the vehicle. Norwegian Army CV9030 infantry fighting vehicles have been using rubber tracks in northern Afghanistan since December 2010. The rubber track system is jointly developed by Soucy International in Quebec, Canada and BAE Systems in Sweden: Soucy has designed and produced the tracks and BAE Systems has qualified the system in full-scale trials. The tracks reduce vehicle weight by more than one tonne compared with conventional steel tracks. They also cut noise by a massive 10dB and vibration levels by 65 percent. Denmark: 45 CV9035 under the designation CV9035DK. Finland: 102 CV9030 under the designation CV9030FIN (57 first batch, 45 second batch). Netherlands: 193 CV9035 under the designation CV9035NL (Initial order of 184 vehicles raised to 193. Deliveries will be completed by 2011). Norway: 104 CV9030 under the designation CV9030N. 17 of these have been upgraded with air-condition, additional mine protection and rear-view cameras, and are designated CV9030NF1. Additional 144 new/upgraded vehicles, including 74 infantry fighting, 21 reconnaissance, 15 command, 16 engineering, 16 multi-role and two driver training vehicles were ordered in 2012. Switzerland: 186 CV9030 under the designation CV9030CH. Sweden: 509 vehicles, including 42 CV9040C. 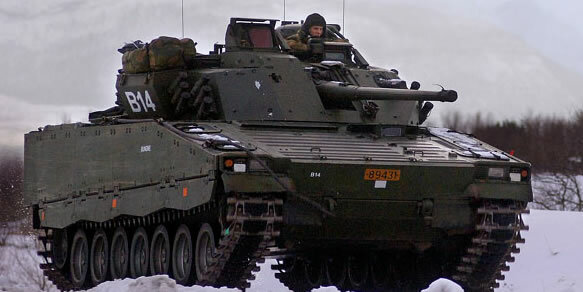 In November 2007, Norwegian CV 90’s contributed in the defence of the Norwegian Forces. In May 2008, Norwegian CV 90’s beat down a Taliban attack. In January 2010, a Norwegian soldier driving a CV9030 was killed when it drove over an IED in Ghowrmach, Afghanistan. By April 2010 two of the ten Danish vehicles sent to Afghanistan have been hit with IEDs.